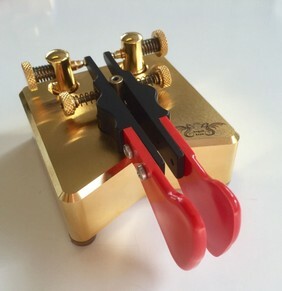 The Simplex is a iambic key with a heavy (1.4 kg or more than 3 pounds) gold or palladium plated base and gold plated components, using long springs for the return force. 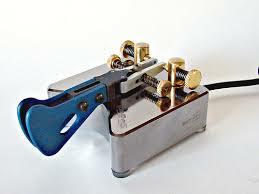 Like our other keys it is manufactured using NC machinery for absolute precision. Micro-threaded screws are used for all adjustments. The arms are held by 4 ball bearings that are embedded in the base, and they are made of a light-weight alloy that provides very low moving mass - this allows excellent responsiveness at high speeds even when set for a very light touch. The contacts are 925/000 silver. The key comes with a protective dust cover. With its uniquely shaped base and finger pieces this key is not only a precision instrument for the CW operator but also a piece of art that you can proudly display!